Cacık, the first dish I’m going to share with you, is a summer favorite. It’s incredibly easy to make, customizable, and a Turkish staple. Most of you will know its much more popular Greek counterpart – tzatziki. The dish originated in the Ottoman Empire, and so it spread around the region and evolved. Tzatziki and cacık are made with the same ingredients, but tzatziki is more of a sauce whereas cacık is a cold soup. In the summer, we like to serve cacık with most meals, in lieu of a salad. It goes well with just about anything – grilled meats, vegetables in any guise, börek, potato salads (not the American kind with mayonnaise, mind you! Cold, sliced potatoes with olive oil and cayenne pepper! ), the list is endless. The version I’m sharing with you today is the one I’ve modified over the years to fit the tastes of my family. Cacık will often have dill in it, but Olivia hates dill, so I leave it out. You can add dill if you like it, to taste. You can also play with proportions, depending on how much you want to make. Cacık lasts 2-3 days and, indeed, tastes better on the second day (as with any food made with olive oil! ), but you don’t want to end up with too much, especially if you are making it for one. I’ve suggested making it with one cucumber and one pot of yogurt, but you can easily halve that. 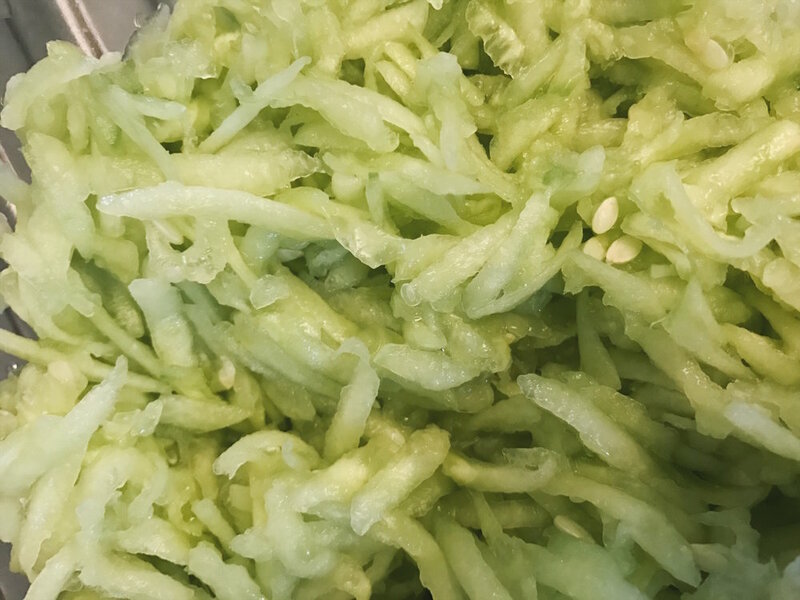 Begin by peeling the cucumber and discarding the peels. Then, shred the cucumber and place in a large bowl. Drizzle olive oil over the cucumber and add pressed garlic, salt, and peppers, to taste. We like our cacık to have more than just a kick of spice, but not everyone has the same spice tolerance! (Though – you can make someone learn to like spice. Olivia’s Swiss boyfriend found my food to be spicy when he first met us, but he can keep up with us now.) Mix everything together. Add yogurt to same bowl, and mix again. Drizzle olive oil over the mixture and sprinkle some more cayenne pepper for display. Ideally let it rest in the refrigerator for at least an hour before your meal. It will be fine if you don’t have the time to let it rest, but the more time it has for all the flavors to soak together, the better it will taste!